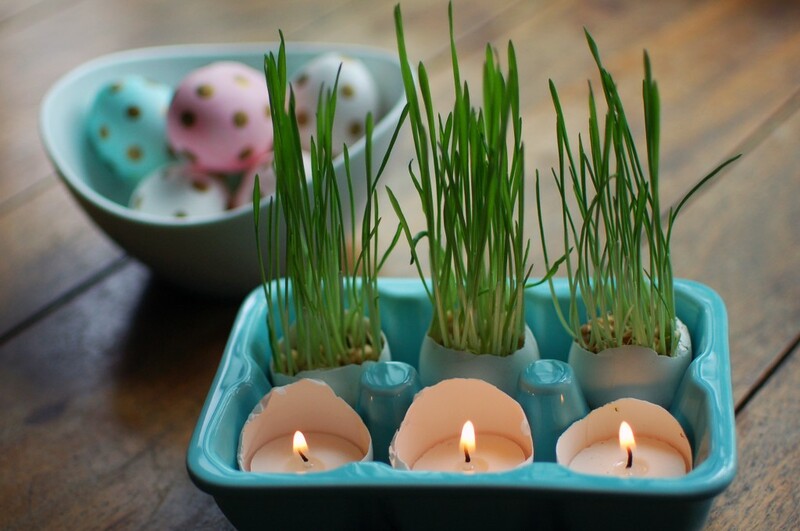 This is part two of my wheatgrass Easter decorations! Since I was growing a lot of wheatgrass anyway, it was little additional effort to grow some in eggshells. Because shells don’t have drainage holes, be careful not to flood them when watering. You can also skip covering them. Otherwise, the growing directions are the same as for a larger container. I bought the super cute ceramic egg crates at TJ Maxx and use them in the fridge year round. They’re everywhere at Easter time — World Market sells some that are nearly identical, and of course Anthro has them. 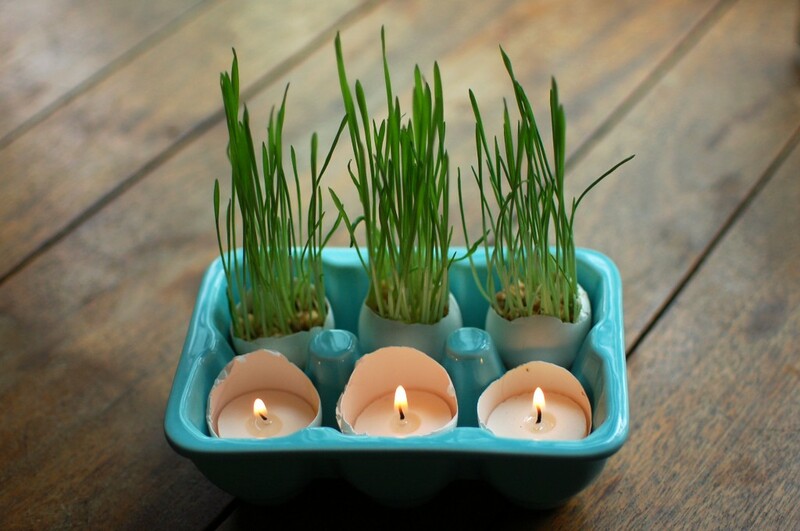 If you aren’t interspersing candles with your wheatgrass shells, cardboard egg cartons would be equally cute and effective. I loved the look of cardboard when I planted succulents in eggshells. 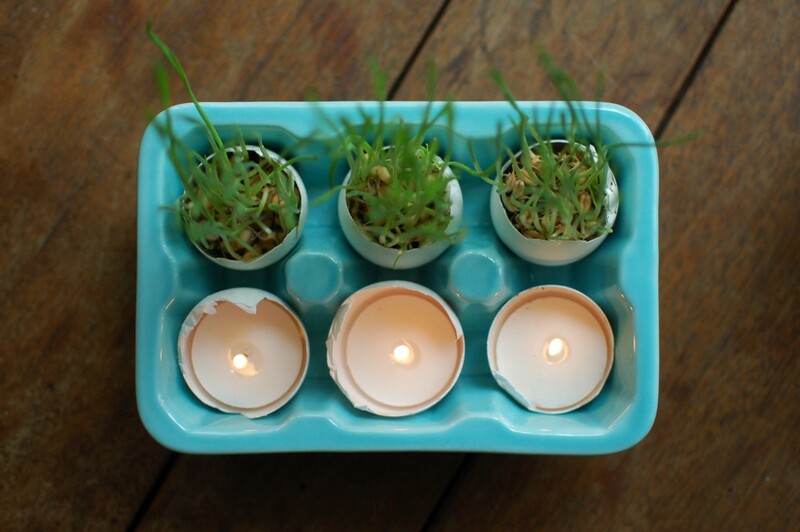 Eggshell candles are also incredibly easy to make! There are plenty of tutorials for adding wicks and hot wax to eggshells, but that’s completely unnecessary. Standard tea-light candles are the perfect size to drop into shells; just remove the metal tin! Be sure to use decent quality candles, so that the wick doesn’t just drop out the bottom when you remove the tin. And I think this goes without saying, but wash those eggshells very thoroughly! Now what else can we put into shells besides eggs?